TV spot by Fr. Vazken Movsesian for Diocesan TV, re: trip to Armenia and issues of Lent. PART 2 of 2 (one week after part 1) February 2009. Audio ONLY in Armenian. TV spot by Fr. Vazken Movsesian for Diocesan TV, re: trip to Armenia and issues of Lent. February 2009. Audio ONLY in Armenian. 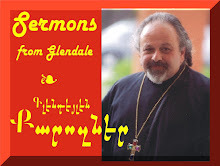 John chapter 6 - Everyday Miracles Bonus - Icons for Anoush Dekmejian, Maria Hamparian and Suzie Shatarevyan (at the end of the sermon) Sermon delivered and recorded LIVE at the Armenian Church Youth Ministries' Center, Glendale. 8 Febraury 2009.